With less than a month before the 2013 FIFA Beach Soccer World Cup kicks off in Tahiti, pressure is on Oceania to name a winner and the Bilikiki are on centre stage as the favourites. With only two matches to play to determine whether their travels will extend to Tahiti, the Bilikiki are looking to avoid the same mistake at the last championship. Two years ago the side returned broken-hearted after seeing Tahiti’s Tiki Toa crush their five year dominance of regional beach soccer. This time round they will not have the Tiki Toa to deal with since the OFC championship only features New Caledonia, Vanuatu and Solomon Islands. Tahiti qualify automatically as hosts. For the Bilikiki, hope and confidence are the keywords as Gideon Omokirio takes them on his biggest assignment yet since retiring as a player in 2011. Omokirio, who was a mainstay in the Bilikiki backline for six years, is making this journey as the head coach for the first time to a world cup qualifying competition. The line up for 2013 is interestingly segmented with veterans like James Naka and Samson Takayama occupying the top tier and followed by the likes of goalkeeper Abraham Bird and wingers, Robert Laua and Augustine Anisi, who come in mid-level in terms of experience. Most of the responsibility will be shouldered by these two groups and this is where they hold an advantage over their opponents which have never had any of their players play in a FIFA Beach Soccer World Cup. The last group which is composed of the new faces features Anthony Talo, more populary known as a futsal goalkeeper, Seni Ngava and Patrick Marie, all of whom are defenders. While all have not tasted international beach soccer, Omokirio is offering his full support to the trio and expects them to step up to the challenge at the regional level. The OFC Beach Soccer Championship will kick off on Saturday 31, August. 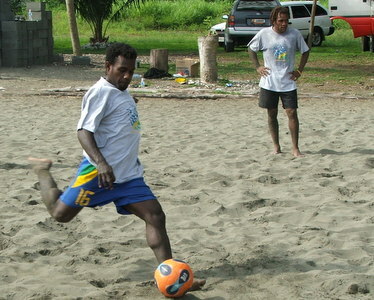 Solomon Islands will play Vanuatu in the opening match of the competition. Their second and final match is against hosts New Caledonia on Monday 2nd September. The competition format is based on the round-robin league system so the winner will be the team with the most points after all teams have played against each other at least once. Bilikiki is sponsored by Our Telekom.